Home › Equipment › Drivers, Fairway Woods & Hybrids › TaylorMade JetSpeed Is All About Speed! Clubhead Speed, Swing Speed and Ball Speed. How many times have you heard the expression “thin to win”? Well, now you’ll be able to take “hitting it thin” to a new level thanks to the JetSpeed driver by TaylorMade. This driver will produce more distance on low struck shots by reducing the spin and launching it high. The combination of faster ball speeds and higher launch angles will lead to greater distance on all shots. To achieve these results, TaylorMade is continuing to ride the wave of their highly successful Speed Pocket design, previously used only on irons. 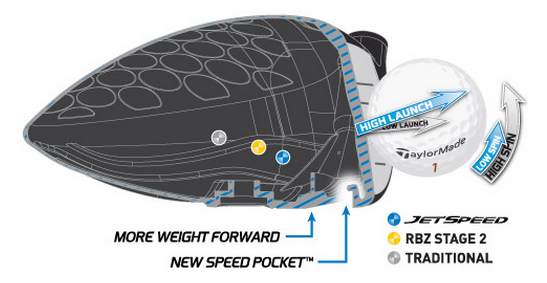 TaylorMade’s innovative design, the Speed Pocket, is so successful that they are incorporating it into the JetSpeed driver. This will be the first driver to ever feature the Speed Pocket design. The Speed Pocket is a slot that has been cut out of the club, behind the face, from heel-to-toe. The slot is filled with polyurethane which enhances the sound and feel of the golf club. The Speed Pocket allows the clubface to flex at impact, rebounding energy to the golf ball faster than ever before. The Speed Pocket in the JetSpeed driver has been radically redesigned, when compared to its previous incorporation in their irons. The design is much smaller and therefore accounts for less weight. Even though it’s smaller it’s just as efficient at boosting ball speed off the clubface. TaylorMade is also incorporating a low and forward center of gravity (CG) location in the JetSpeed driver. This technology has been used in previous TaylorMade drivers, most recently the SLDR. It has shown that this CG location generates faster ball speeds and lower spin when compared to the drivers of old that featured a low and back CG. The combination of the low and forward CG with the Speed Pocket drastically minimizes the spin produced on golf shots, translating to long and powerful drives. The Loft-Sleeve on the shaft is a fine tuning feature of the driver, which enhances the launch angle. It can be altered into a variety of twelve different positions to effectively change the loft of the driver +/- 1.5 degrees from the standard loft setting. The JetSpeed is available in 9.5, 10.5, and 13 degrees of loft. Be aware that this driver will significantly lower the ball spin, which is necessary for the golf ball to fly extreme distances. You’ll need more loft than usual to achieve an optimum launch angle, so just make sure to take this into consideration. The shaft on the JetSpeed driver is the Matrix Velox T. The driver shaft length will be 46 inches and weigh 49 grams. This shaft, while long and very light, is built for increasing speed and maximizing overall distance. So, naturally this shaft is a perfect fit for the JetSpeed driver. It is available in senior, regular, stiff and extra stiff. For those seeking the JetSpeed TP driver, the shaft will be the only difference between the two clubs. The TP shaft will be heavier, weighing 60 grams. The TaylorMade JetSpeed fairway wood has a sleek and shallow appearance. The clubhead is smaller, from sole to crown, than previous fairway woods manufactured by TaylorMade. This size allows the CG to be lower and forward, relative to the center of the clubface. The shallow clubhead design makes it easier to launch the golf ball from the tee or turf, achieving more distance than ever before. The face of the golf club is made of an ultra-strong steel alloy that increases ball spee. This design inspires confidence at set-up, leaving no doubt that this club will perform at the highest level. 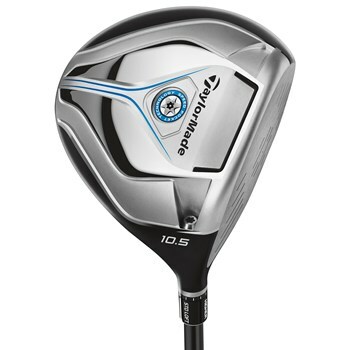 The JetSpeed fairway wood is available in 15, 17, 19, 21 and 23 degrees of loft. The TaylorMade JetSpeed hybrid is available in 17, 19, 22, 25 and 28 degrees of loft. As you can tell the JetSpeed driver, fairway wood, and rescue are all about producing crazy amounts of speed. The combination of a light-weight clubheads, shafts and head shapes will have you gaining massive amounts of speed all around; swing speed, clubhead speed and ball speed. All of this combined velocity will have you booming the ball all season long. Don’t be left behind! Email our PGA Professionals for excellent club and swing advice, or check out our club comparison on the TaylorMade JetSpeed and RBZ Stage 2.